No Le’veon Bell, no proble. Pittsburgh Steelers running back James Conner (30) celebrates his touchdown against the Carolina Panthers during the first half Thursday in Pittsburgh. PITTSBURGH – The Pittsburgh Steelers aren’t playing like a team missing Le’Veon Bell. Antonio Brown added eight receptions for 96 yards – including a 53-yard touchdown in the second quarter – to cap an eventful day that began with the star wide receiver being cited for reckless driving after police clocked Brown’s Porsche driving over 100 mph down a busy highway in the northern city suburbs. 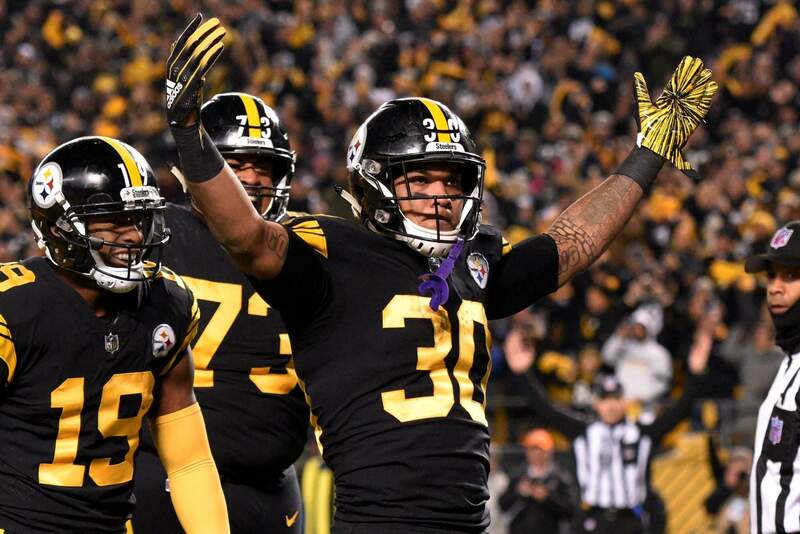 While Bell – a three-time Pro Bowl running back who still hasn’t signed his one-year franchise tender – tweeted his thoughts as he watched on television, the Steelers (6-2-1) rolled on without him. Bell has until next Tuesday to sign a contract if he wants to play this season. His teammates have long since tired of talking about Bell’s status and at this point, the AFC North leaders appear to be doing just fine on their own.